SANTA FE SPRINGS, Calif. – Three-time Pro Stock Motorcycle champion Angelle Sampey will team up with longtime rivals Vance & Hines to compete in the first four NHRA Mello Yello Drag Racing Series events of the new season. 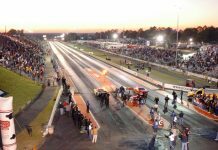 Sampey will ride a Screamin’ Eagle Harley-Davidson Street Rod starting at the 50th annual Amalie Motor Oil NHRA Gatornationals at Gainesville (Fla.) Raceway in March, alongside teammates and fellow champions Andrew Hines and Eddie Krawiec. 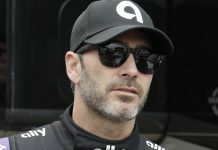 The 42-time Pro Stock Motorcycle winner will also race for Vance & Hines as a showcase rider at the two Four-Wide events at The Strip at Las Vegas Motor Speedway and zMAX Dragway in Concord, N.C., as well as at the Southern Nationals at Atlanta (Ga.) Dragway. National Dragster Senior Editor Kevin McKenna and NHRA.com first broke the story. Sampey won her three class titles in consecutive years from 2000-02, crossing paths with the Vance & Hines team many times along the way.